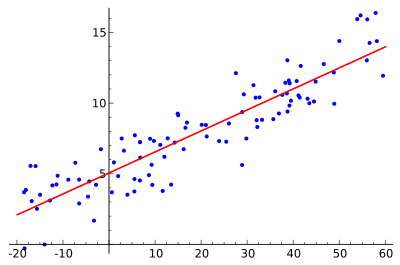 If the goal is prediction, or forecasting, or error reduction,[clarification needed] linear regression can be used to fit a predictive model to an observed data set of values of the response and explanatory variables. After developing such a model, if additional values of the explanatory variables are collected without an accompanying response value, the fitted model can be used to make a prediction of the response. 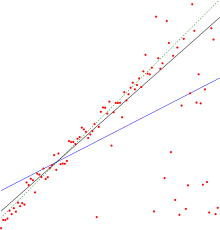 In linear regression, the observations (red) are assumed to be the result of random deviations (green) from an underlying relationship (blue) between a dependent variable (y) and an independent variable (x).
. The decision as to which variable in a data set is modeled as the dependent variable and which are modeled as the independent variables may be based on a presumption that the value of one of the variables is caused by, or directly influenced by the other variables. Alternatively, there may be an operational reason to model one of the variables in terms of the others, in which case there need be no presumption of causality. is sometimes called the design matrix.
. The corresponding element of β is called the intercept. Many statistical inference procedures for linear models require an intercept to be present, so it is often included even if theoretical considerations suggest that its value should be zero. is p-dimensional). Its elements are known as effects or regression coefficients (although the latter term is sometimes reserved for the estimated effects). 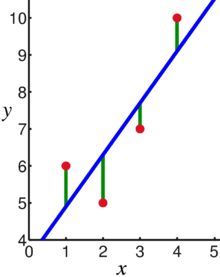 Statistical estimation and inference in linear regression focuses on β. The elements of this parameter vector are interpreted as the partial derivatives of the dependent variable with respect to the various independent variables.
. This part of the model is called the error term, disturbance term, or sometimes noise (in contrast with the "signal" provided by the rest of the model). This variable captures all other factors which influence the dependent variable y other than the regressors x. 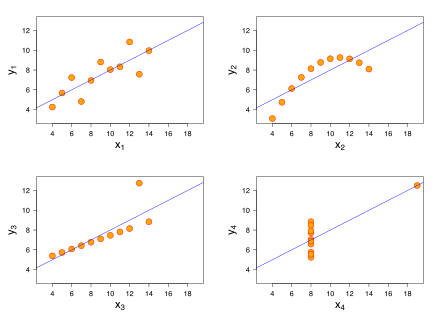 The relationship between the error term and the regressors, for example their correlation, is a crucial consideration in formulating a linear regression model, as it will determine the appropriate estimation method. The notion of a "unique effect" is appealing when studying a complex system where multiple interrelated components influence the response variable. In some cases, it can literally be interpreted as the causal effect of an intervention that is linked to the value of a predictor variable. However, it has been argued that in many cases multiple regression analysis fails to clarify the relationships between the predictor variables and the response variable when the predictors are correlated with each other and are not assigned following a study design. Commonality analysis may be helpful in disentangling the shared and unique impacts of correlated independent variables. is still assumed, with a matrix B replacing the vector β of the classical linear regression model. Multivariate analogues of Ordinary Least Squares (OLS) and Generalized Least Squares (GLS) have been developed. "General linear models" are also called "multivariate linear models". These are not the same as multivariable linear models (also called "multiple linear models"). range of the linear predictor and the range of the response variable. Single index models[clarification needed] allow some degree of nonlinearity in the relationship between x and y, while preserving the central role of the linear predictor β′x as in the classical linear regression model. Under certain conditions, simply applying OLS to data from a single-index model will consistently estimate β up to a proportionality constant. , then the optimal estimator is the 2-step MLE, where the first step is used to non-parametrically estimate the distribution of the error term. Least squares linear regression, as a means of finding a good rough linear fit to a set of points was performed by Legendre (1805) and Gauss (1809) for the prediction of planetary movement. Quetelet was responsible for making the procedure well-known and for using it extensively in the social sciences. ^ Rencher, Alvin C.; Christensen, William F. (2012), "Chapter 10, Multivariate regression – Section 10.1, Introduction", Methods of Multivariate Analysis, Wiley Series in Probability and Statistics, 709 (3rd ed. ), John Wiley & Sons, p. 19, ISBN 9781118391679 . ^ Hilary L. Seal (1967). "The historical development of the Gauss linear model". Biometrika. 54 (1/2): 1–24. doi:10.1093/biomet/54.1-2.1. JSTOR 2333849. ^ Yan, Xin (2009), Linear Regression Analysis: Theory and Computing, World Scientific, pp. 1–2, ISBN 9789812834119, Regression analysis ... is probably one of the oldest topics in mathematical statistics dating back to about two hundred years ago. The earliest form of the linear regression was the least squares method, which was published by Legendre in 1805, and by Gauss in 1809 ... Legendre and Gauss both applied the method to the problem of determining, from astronomical observations, the orbits of bodies about the sun. ^ a b Tibshirani, Robert (1996). "Regression Shrinkage and Selection via the Lasso". 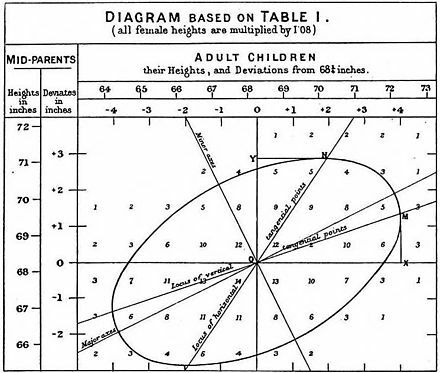 Journal of the Royal Statistical Society, Series B. 58 (1): 267–288. JSTOR 2346178. ^ a b Efron, Bradley; Hastie, Trevor; Johnstone, Iain; Tibshirani, Robert (2004). "Least Angle Regression". The Annals of Statistics. 32 (2): 407–451. arXiv:math/0406456. doi:10.1214/009053604000000067. JSTOR 3448465. ^ a b Hawkins, Douglas M. (1973). "On the Investigation of Alternative Regressions by Principal Component Analysis". Journal of the Royal Statistical Society, Series C. 22 (3): 275–286. JSTOR 2346776. ^ a b Jolliffe, Ian T. (1982). "A Note on the Use of Principal Components in Regression". Journal of the Royal Statistical Society, Series C. 31 (3): 300–303. JSTOR 2348005. ^ Berk, Richard A. (2007). "Regression Analysis: A Constructive Critique". Criminal Justice Review. 32 (3): 301–302. doi:10.1177/0734016807304871. ^ Warne, Russell T. (2011). "Beyond multiple regression: Using commonality analysis to better understand R2 results". Gifted Child Quarterly. 55 (4): 313–318. doi:10.1177/0016986211422217. ^ Brillinger, David R. (1977). "The Identification of a Particular Nonlinear Time Series System". Biometrika. 64 (3): 509–515. doi:10.1093/biomet/64.3.509. JSTOR 2345326. ^ Lange, Kenneth L.; Little, Roderick J. A.; Taylor, Jeremy M. G. (1989). "Robust Statistical Modeling Using the t Distribution". Journal of the American Statistical Association. 84 (408): 881–896. doi:10.2307/2290063. JSTOR 2290063. ^ Swindel, Benee F. (1981). "Geometry of Ridge Regression Illustrated". The American Statistician. 35 (1): 12–15. doi:10.2307/2683577. JSTOR 2683577. ^ Draper, Norman R.; van Nostrand; R. Craig (1979). "Ridge Regression and James-Stein Estimation: Review and Comments". Technometrics. 21 (4): 451–466. doi:10.2307/1268284. JSTOR 1268284. ^ Hoerl, Arthur E.; Kennard, Robert W.; Hoerl, Roger W. (1985). "Practical Use of Ridge Regression: A Challenge Met". Journal of the Royal Statistical Society, Series C. 34 (2): 114–120. JSTOR 2347363. ^ Narula, Subhash C.; Wellington, John F. (1982). "The Minimum Sum of Absolute Errors Regression: A State of the Art Survey". International Statistical Review. 50 (3): 317–326. doi:10.2307/1402501. JSTOR 1402501. ^ Stone, C. J. (1975). "Adaptive maximum likelihood estimators of a location parameter". The Annals of Statistics. 3 (2): 267–284. doi:10.1214/aos/1176343056. JSTOR 2958945. ^ Goldstein, H. (1986). "Multilevel Mixed Linear Model Analysis Using Iterative Generalized Least Squares". Biometrika. 73 (1): 43–56. doi:10.1093/biomet/73.1.43. JSTOR 2336270. ^ Theil, H. (1950). "A rank-invariant method of linear and polynomial regression analysis. I, II, III". Nederl. Akad. Wetensch., Proc. 53: 386–392, 521–525, 1397–1412. MR 0036489 ; Sen, Pranab Kumar (1968). "Estimates of the regression coefficient based on Kendall's tau". Journal of the American Statistical Association. 63 (324): 1379–1389. doi:10.2307/2285891. JSTOR 2285891. MR 0258201 . ^ Deaton, Angus (1992). Understanding Consumption. Oxford University Press. ISBN 978-0-19-828824-4. ^ a b Krugman, Paul R.; Obstfeld, M.; Melitz, Marc J. (2012). International Economics: Theory and Policy (9th global ed.). Harlow: Pearson. ISBN 9780273754091. ^ Laidler, David E. W. (1993). The Demand for Money: Theories, Evidence, and Problems (4th ed.). New York: Harper Collins. ISBN 978-0065010985. ^ a b Ehrenberg; Smith (2008). Modern Labor Economics (10th international ed.). London: Addison-Wesley. ISBN 9780321538963. ^ "Linear Regression (Machine Learning)" (PDF). University of Pittsburgh. ^ Stigler, Stephen M. (1986). The History of Statistics: The Measurement of Uncertainty before 1900. Cambridge: Harvard. ISBN 0-674-40340-1. Draper, N.R. ; Smith, H. (1998). Applied Regression Analysis (3rd ed.). John Wiley. ISBN 978-0-471-17082-2. Pedhazur, Elazar J (1982). Multiple regression in behavioral research: Explanation and prediction (2nd ed.). New York: Holt, Rinehart and Winston. ISBN 978-0-03-041760-3.